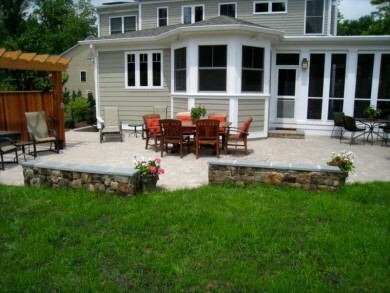 At O’Grady’s Landscape, designing and building custom patios for clients throughout Vienna, Virginia is our specialty. Whether you want the perfect space for outdoor entertaining or relaxing with a beautiful view, we’ll tailor the design to your unique goals and the surrounding landscape for an end result that’s picture-perfect. Your patio is at the heart of your outdoor living space, so you can rest assured we’ll approach your project with thoughtful designs and careful craftsmanship. To schedule your consultation for patio installation in Vienna, Virginia, contact us today at 703-533-5001. Paver patio designs – known to be long-lasting and durable, pavers are available in brick, concrete, or stone. Flagstone patio designs – offering a natural look that’s easy to maintain, stone options include travertine, slate, sandstone, and more. For a better idea of our paver and flagstone patio designs in Vienna, VA, view our design gallery with examples of our previous work. At O’Grady’s Landscape, we take pride in our patio designs throughout Vienna, VA, approaching each project methodically and with the highest quality materials for a long-lasting and beautiful final product. Whether you’ve dreamed of the perfect space to lounge by the pool or you want a spacious area for outdoor entertainment, we can help you achieve all your goals, and you can rest assured you’ll receive extremely timely customer support services and project management every step of the way. Create a beautiful, inviting outdoor space with the finest quality patio designs by O’Grady’s Landscape—call today at 703-533-5001 for an estimate on patio installation in Vienna, VA!